Would you like a flavor of the country? Garden Gate Farm gives you a taste of true working farm in central United States of Good Ole America! Come see turkeys and pigs and cattle and ducks and chickens and vegetables and vegetables, and vegetables and heirloom vegetables and eggs and come see what else more! Farm tours available. Children welcome. The large variety of farm animals makes their tour interesting! 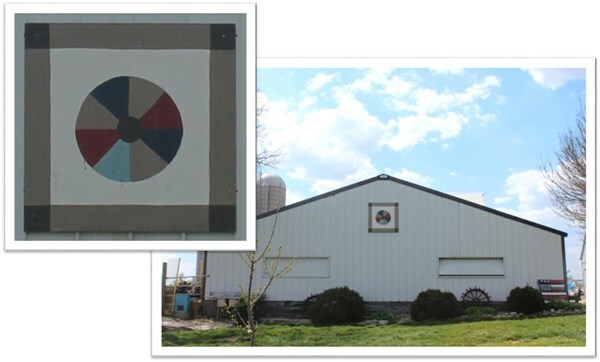 Also, not only does Beth Rinkenberger have a barn quilt, if you have an interest in knowing how to make a barn quilt yourself, she will help you. Need to have ideas? Need a design? Need it painted? Want to just talk? Don’t have a barn but just interested in what happens and why people like them? Ask Beth! She is a la carte! A la Carte with produce, meat, barn quilts, tours! Interested in visiting? Call her at (815)692-3518. Leave a message if she does not answer. She may be working in the garden or maybe helping an animal on the farm. The Dresden Plate pattern was chosen because Beth is interested in quilts and antique dishes. She also liked the continuity of the pattern much like the circle of our family…held together with love, respect and God in the center. Step back in time and experience a good old fashioned farm. Fresh from local farm to table at the Hampsher Bed & Breakfast where Beth shares some of the hospitality. They raise non-gmo, pastured animals, specializing in turkeys. Groups are welcome and can give approximately an hour-long tour of gardens, hoop buildings, and farm animals. Drinks and snacks are available for a fee.